The holidays are upon us, and my family has been asking me what kind of gift ideas are on my boys’ wishlists this year. As I was compiling a list of ideas, I thought it might be fun to share with you some of my favorite gift idea for creative kids – perfect for Christmas presents and birthday gifts! Kinetic Sand is all the rage this year, and with good reason! It’s a fun sensory experience that will provide hours of fun. Available in 2 lb boxes or pick up an 11 lb box for the entire family! Picasso Tiles are magnetic building tiles that can be arranged in endless formations. Perfect for your budding engineers! Wreck This Journal and Finish This Book (both by Keri Smith) encourage young writers and artists to stretch their imaginations with engaging and entertaining prompts. Great for ALL ages! Snap Circuits Jr. comes with over 30 pieces to create 101 different electronic projects. The pieces, which include snap wires, slide switches, an alarm circuit, a music integrated circuit, and a speaker, snap together easily on the included plastic grid. Learn while you play! Melissa & Doug Suspend is a fun balance game that the entire family will enjoy. Suspend can be played four different ways for versatile game play to accommodate everyone from beginners to experts. The Original Spirograph is as much fun today as it was when you were a kid! ZOOBMobile Car Designer Kit is another great idea for building fanatics. Contains 76 ZOOB pieces designed for building vehicles, 12 wheels with rubber tires that are notched to work like gears, and three guides with instructions for 12 models (kids can build up to three vehicles at once). If you have a child who loves to take things apart and put them back together, the Battat Take-a-Part Airplane is made just for you! Aquarelle Painting Kits make watercolor painting simple. The three canvases are pre-printed with a thin white wax outline, which acts as a guide for the picture and prevents the colors from running. Once you’ve completed your painting, the wax design becomes a perfect white outline, showing all the detail in your design. With the Design & Drill Activity Center, children design their own learning fun! 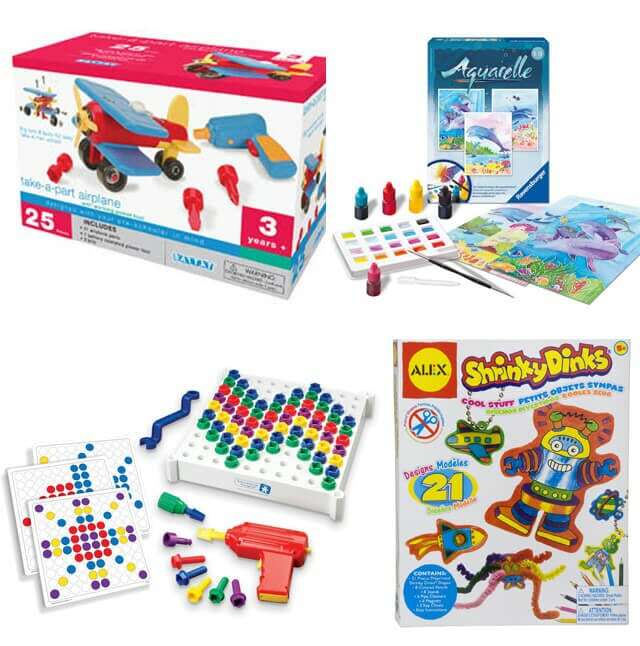 The sturdy board, big bolts, colorful activity cards, and realistic tools encourage young learners to develop a variety of important skills, from color recognition and counting to fine-motor skills and following directions. Shrinky Dinks are another classic favorite that are still keeping kids entertained after all these years! This Shrinky Dink Cool Stuff package contains over twenty pre-printed and pre-cut shrinky dinks, eight color pencils, two key chains, sticky back magnets, pipe cleaners, stands and easy to follow instructions. Cardboard Playhouses are TONS of fun! 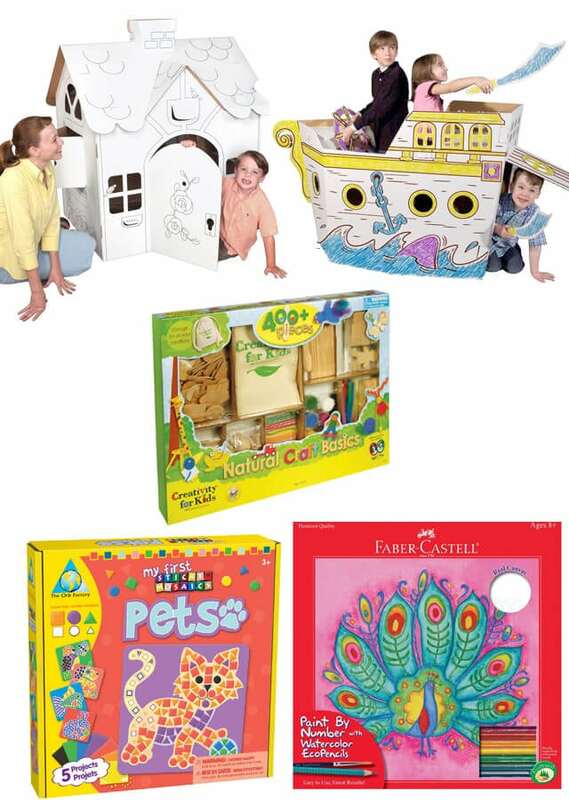 From cottages to pirate ships, princess carriages to castles, these sturdy cardboard creations are sure to provide hours of creative play! Looking for some old fashioned fun? 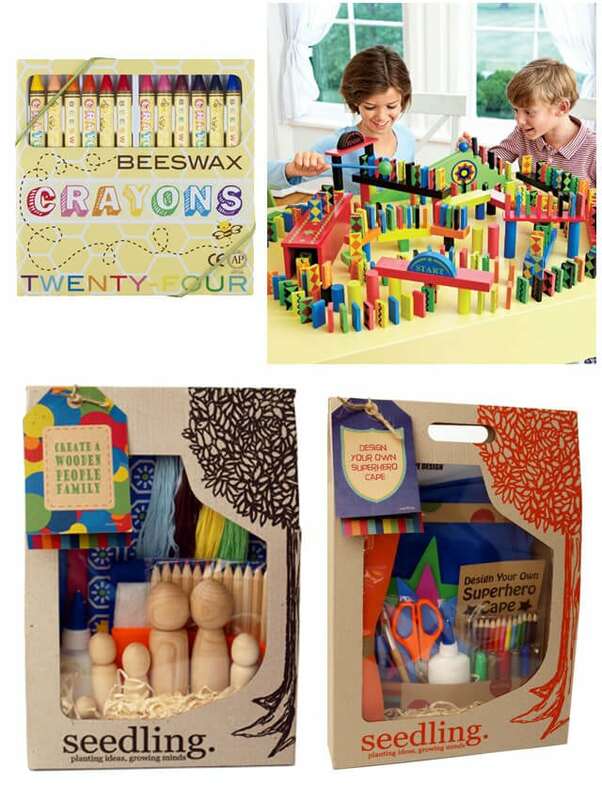 The Creativity for Kids Classic Wood Crafts Kit contains over 400 total pieces including jumbo craft sticks, flat & dimensional wood shapes, spools, beads, spoons, wooden people, paints, feathers, chenille stems, craft glue (and more!) along with an instruction and idea booklet for hours of creative crafting. My First Sticky Mosaics are great for preschoolers and younger kids to practice their fine motor skills and hand-eye coordination. Create fun mosaic pictures with sticky foam pieces that are sized for small hands. Watercolor pencils are a favorite in our home, and the Paint-by-Number Watercolor Kits by Faber-Castell make watercolor painting simple! Make-a-Plate is another classic activity that is still as much fun as you remember! Kids love creating plates with their own designs, and the finished results make great gifts, too! Melissa & Doug Peel & Press “Stained Glass” is a guided arts-and-crafts activity that gives young artists everything they need to create a shimmering “stained glass” light catcher. It’s easy to create: just match the stickers to the number key and place them on the see-through design template. You really can’t go wrong with spin art, and this Fantastic Spinner is sure to be a big hit with kids of all ages! Perler Beads are another one of our favorite family activities! Arrange them in a pattern to create your own design, using your pegboard, and then iron with a piece of ironing paper to fuse beads together. This inexpensive craft will produce hundreds (if not thousands!) of unique creations, so be sure to snag an extra pack of patterns to keep the creativity flowing. Beeswax Crayons are one of my favorite art supply splurges. Yes, they’re pricier than your standard yellow-box crayons, but once you try them you’ll be hooked, too! The colors are rich and vibrant, and they glide smoothly and evenly across the paper. This Domino Race Set is the perfect rainy day activity! Arrange the dominoes in a serpentine pattern, up and down steps, over and under bridges and end with a bang. Tip the first domino to start a chain reaction that brings the whole array down in seconds! Includes over 400 pieces including starting and finish gates, pyramid steps, 13-piece stairs, and bridge set. 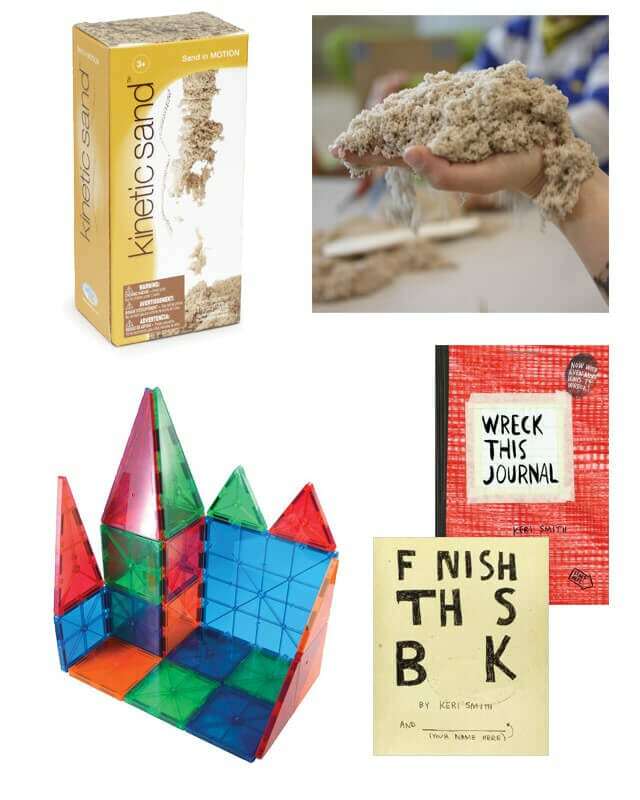 Seedling offers some incredibly creative kits that encourage the natural process of thinking and doing. I’ve fallen in love with them all, but I’m particularly smitten with the Create a Wooden People Family and Design Your Own Superhero Cape kits. 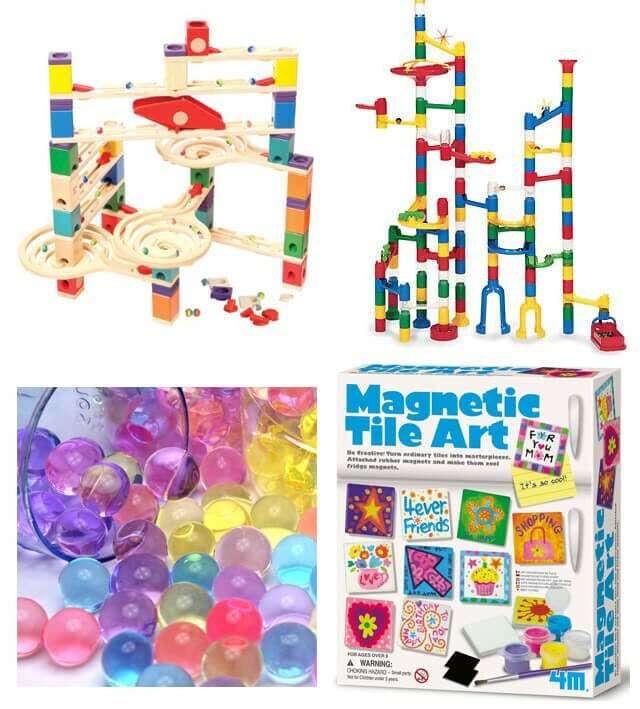 Marble runs provide hours of fun as children create endless 3-d structures and raceways for their marbles to travel. The Hape Quadrilla is the most stable wooden marble run on the market, but it is on the higher end of the budget. Mindware offers a less expensive (but just as fun!) plastic version. 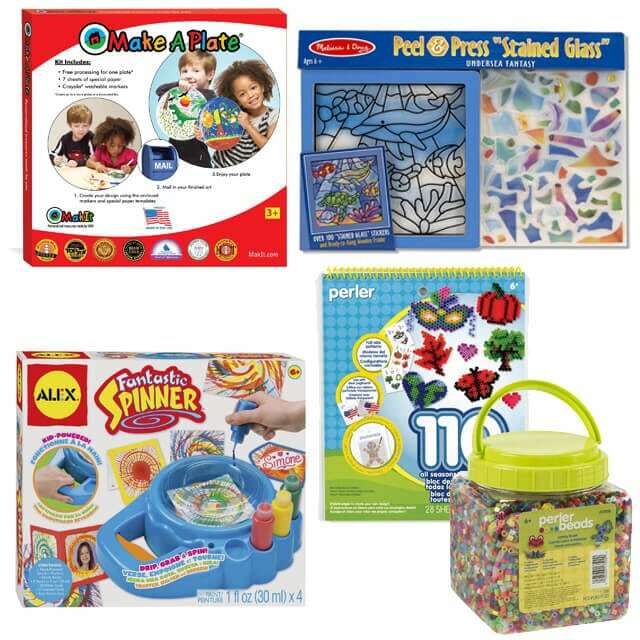 Water beads can be used in TONS of fun activities – check out a few of them here on Pinterest! Magnetic Tile Art lets kids turn ordinary 2″x2″ tiles into extraordinary works of art. Attach the included magnets on the back and pop them onto the fridge! 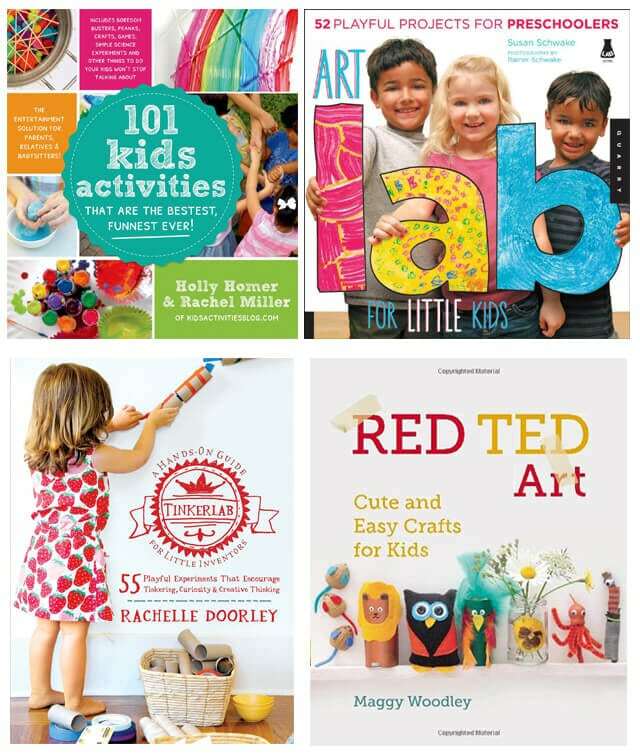 SO many great creative gifts for kids! I am bookmarking several of these for my nephew. What a great group of creative gifts! I see several things on here that my grandsons have talked about. 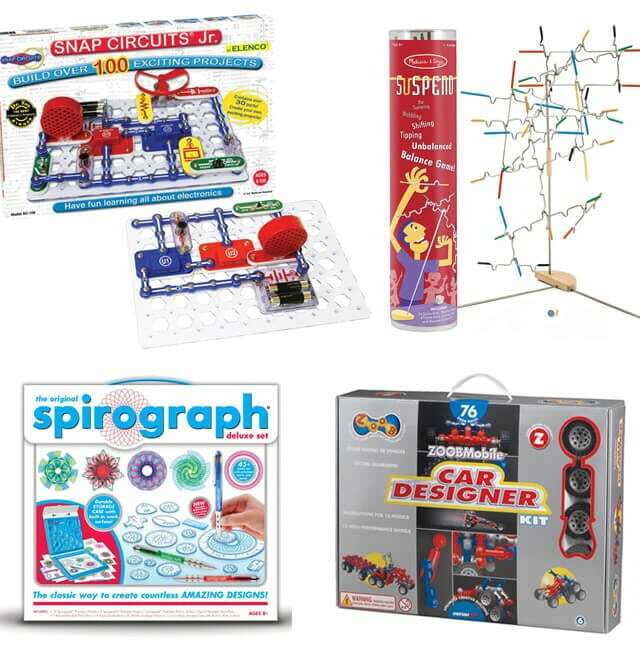 I love this as my daughter actually has the spirograph on her list – as every kid need one of those! Great list! I love all these gifts for kids! I might need to grab some for myself! So funny with this list! I either have them or they have been already ordered fro this year! ahahhahaha I loooove it!